Are you starting a new diet this year? 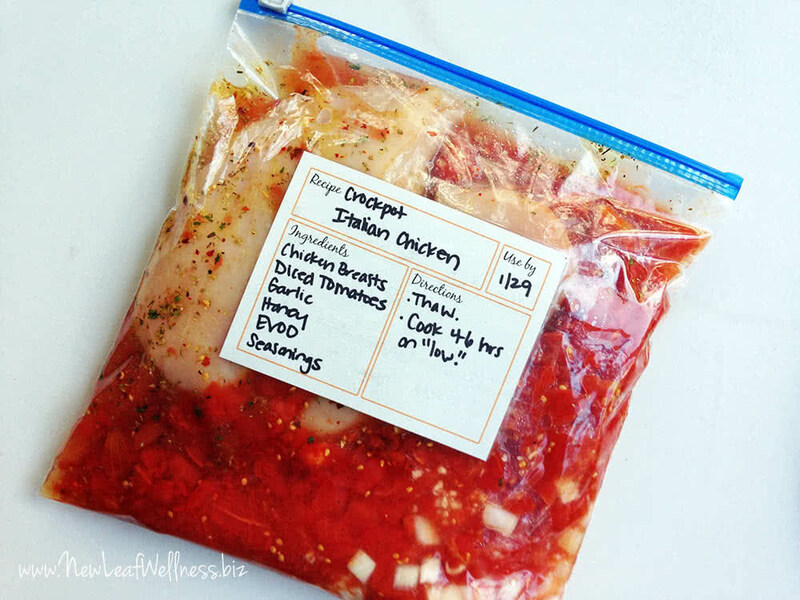 Here are some of my crockpot freezer meal prep sessions that will make life easier for you. 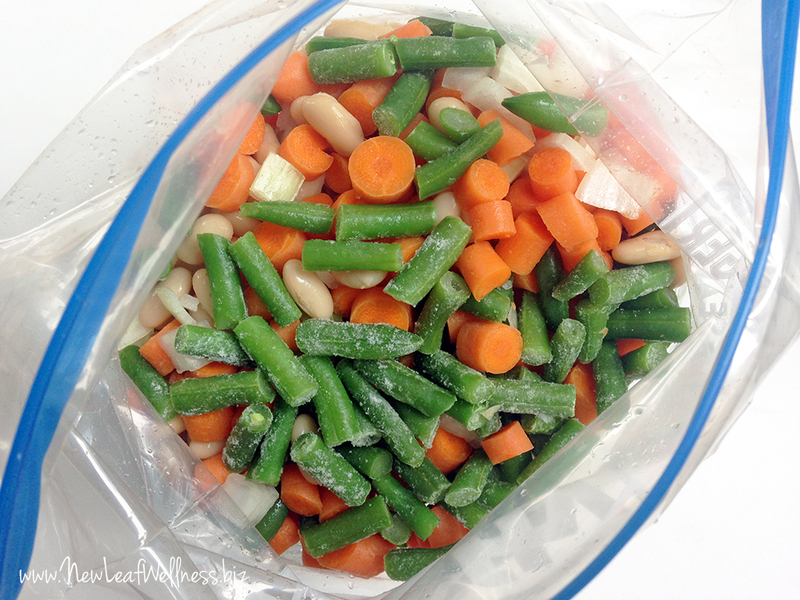 During the “prep session,” all you need to do is assemble the ingredients and freeze them. 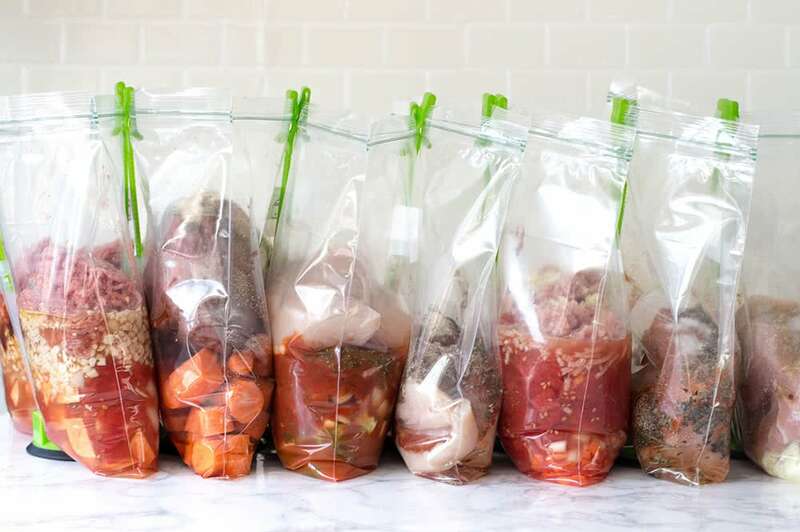 (You literally combine the meat, vegetables, and spices in bags and stick them in your freezer for up to three months – there’s no cooking ahead of time.) Then you cook the frozen meal in your crockpot later and feel like a rockstar. 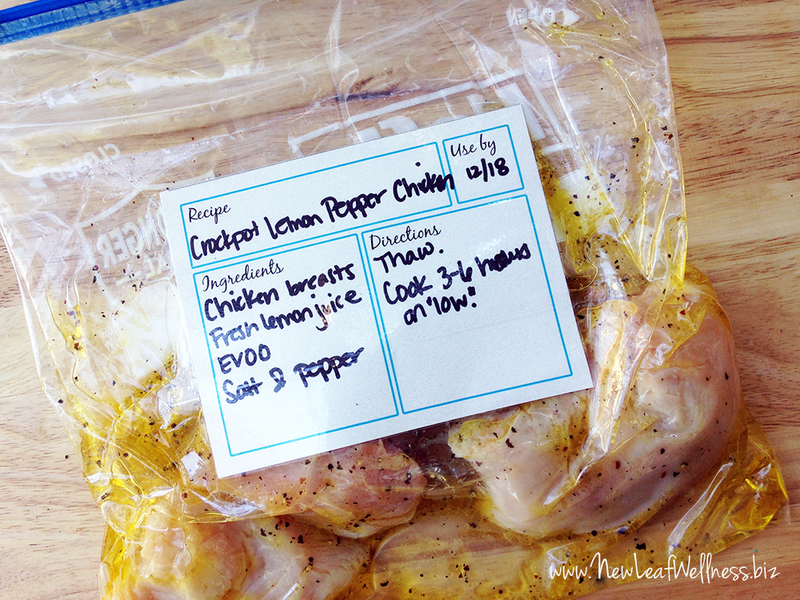 Every prep session includes free printable recipes and a shopping list so the process couldn’t be easier. I also have cookbook eBooks for all of these diets with printable shopping lists and nutritional info. If you don’t find what you’re looking for, leave a comment at the bottom of this post and I’ll work on it next. 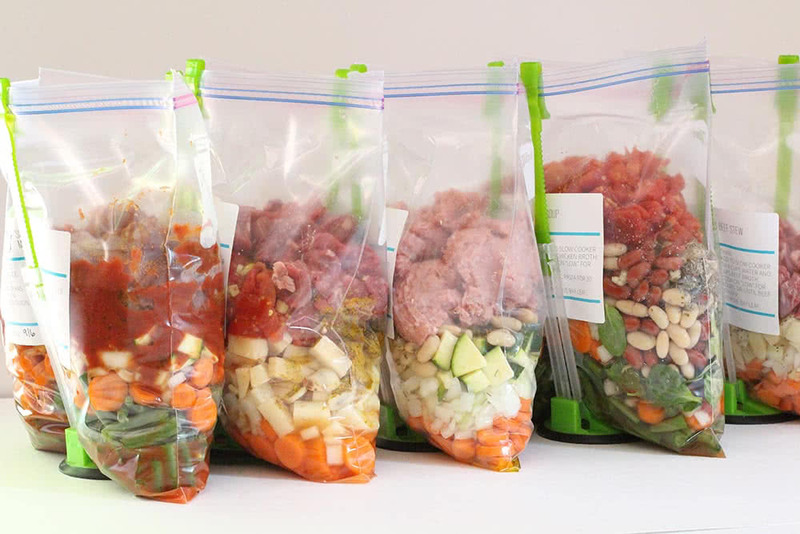 What’s so great about these diet-friendly freezer meals? They’re frozen without any cooking ahead of time. That means they’re quick and easy to prep and cook for the first time out of the freezer so they don’t taste like leftovers at all. Yay! I made all of them myself. That means I know how much time and money they require to make. I also know that they’re absolutely delicious. They make it easier to stick to your diet. Just think…less dirty dishes, fewer trips to the grocery store, and less brainpower required to figure out what to eat. Plus, your husbands and kids are going to like these meals too. Are you with me, Friends? 7 Whole30 Instant Pot Freezer Meals in 70 Minutes. This prep session includes recipes for steak Italiano, spiced butternut squash soup, turkey bolognese sauce, beef and sweet potato chili, southwestern shredded pork, stuffed pepper soup, and Paleo sesame short ribs. 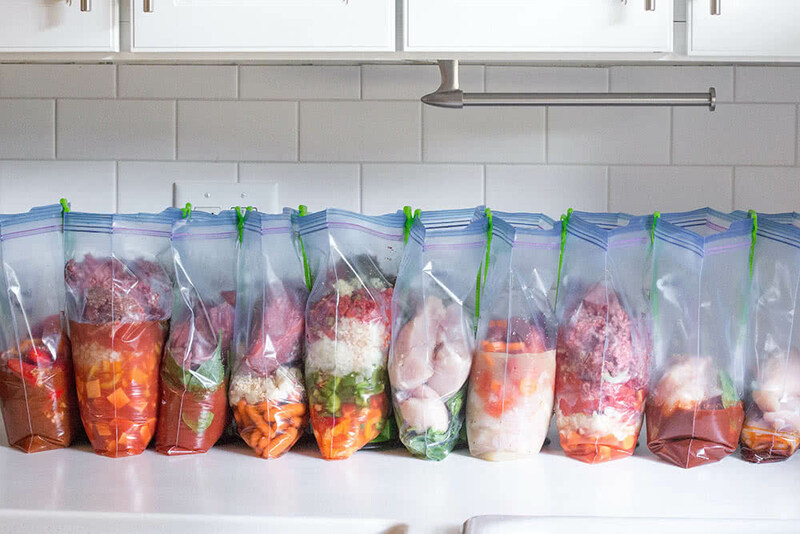 10 Whole30 Crockpot Freezer Meals in 90 Minutes. This prep session includes recipes for steak Italiano, cool ranch chicken, sausage-stuffed mini sweet peppers, Tuscan chicken stew, classic pot roast, stuffed pepper soup with cauliflower rice, lemon chicken with baby spinach, beef and sweet potato chili, shredded chicken enchiladas, and beef and cabbage soup. The Ultimate Whole30 Slow Cooker Freezer Meal Plan. 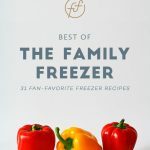 This prep session includes 30 crockpot freezer recipes, a printable shopping list, a filled out meal planning calendar, printable freezer meal labels, and more. My favorite recipes are cool ranch shredded chicken, cherry pork loin, spaghetti squash, red pepper chicken, and chicken cacciatore. Yum. 7 Whole30 Crockpot Freezer Meals in 1 Hour. This prep session includes recipes for cool ranch shredded chicken, turkey bolognese sauce, Mediterranean shredded pork, sweet potato chipotle chili, Mexican pot roast with carrots, southwestern shredded pork, and chicken cacciatore. 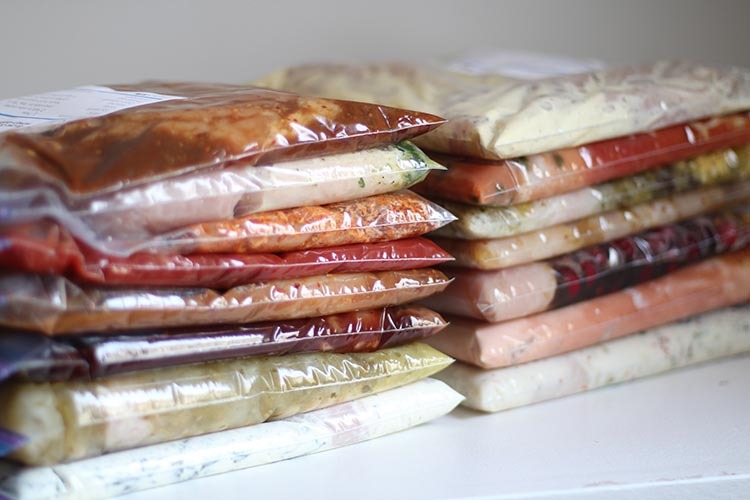 31 Keto Crockpot Freezer Meals. This post includes 31 crockpot freezer recipes that will work with a Ketogenic diet as well as high-fat side dishes. My favorite recipes are crack chicken, broccoli cheddar soup, mozzarella-stuffed turkey pesto meatballs, mushroom spinach stroganoff, zucchini “lasagna,” and Indian butter chicken. 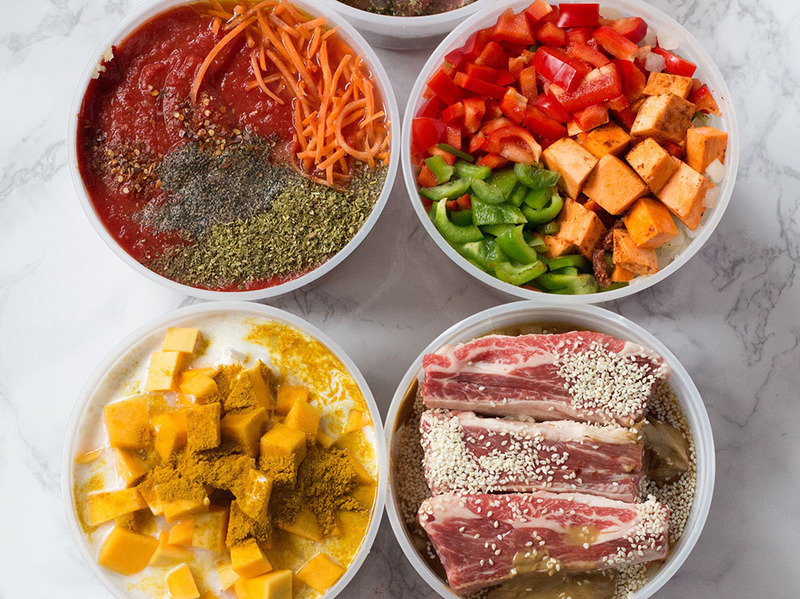 31 Paleo Crockpot Freezer Meals. 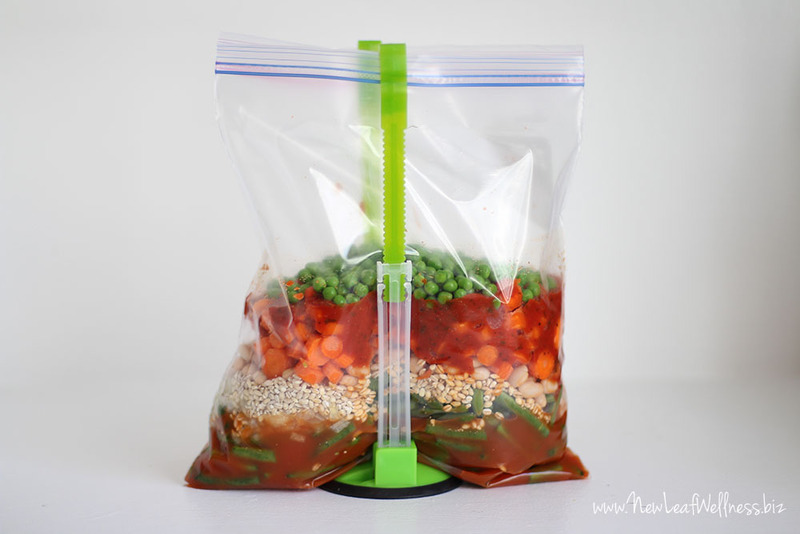 This is a great post with 31 healthy, delicious, and budget-friendly meals that you can freeze for your crockpot. Some of my favorite recipes are cool ranch shredded chicken, stuffed peppers, chicken fajitas (serve over salad), chicken curry, and jalapeño popper chicken. A quick disclaimer: If you decide to make any of these meals for someone with a food allergy or intolerance, please read every single ingredient’s nutritional label. For example, gluten and dairy can be hidden in items that you wouldn’t expect, like seasoning mixes, vinegars, soy sauce, broths, etc. 10 Gluten-Free and Dairy-Free Crockpot Freezer Meals in One Hour. This prep session includes recipes for turkey black bean chili, lemon pepper chicken, chicken fajitas, salsa verde shredded pork tacos, steak Italiano marinara, Korean beef lettuce wraps, Italian chicken, chicken teriyaki, taco soup, and cranberry pork roast. We love these recipes and make them over and over again. 7 Whole30 Crockpot Freezer Meals in 1 Hour. This prep session includes recipes for cool ranch shredded chicken, turkey bolognese sauce, Mediterranean shredded pork, sweet potato chipotle chili, Mexican pot roast with carrots, southwestern shredded pork, and chicken cacciatore. Check the spaghetti sauce, Italian seasoning, and chicken broth for hidden sources of gluten. 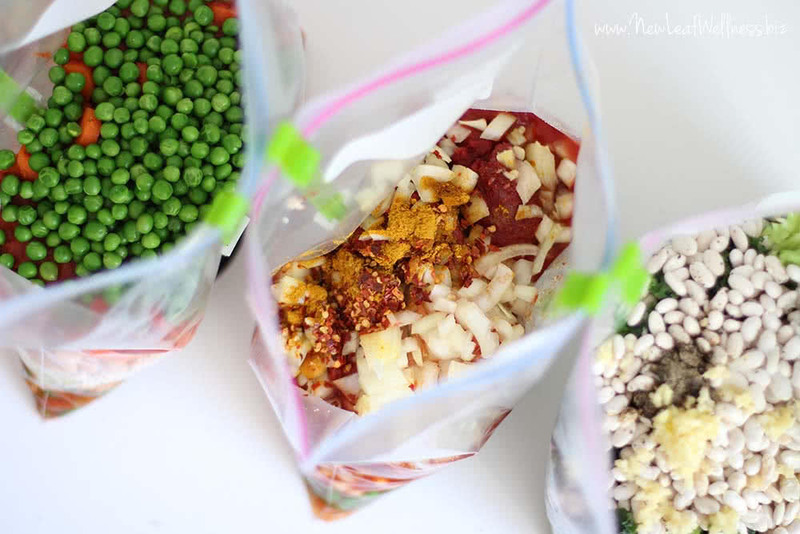 8 Healthy Crockpot Freezer Meals in 45 Minutes. This prep session includes recipes for chicken fajitas, Italian chicken and veggies, honey dijon chicken and red potatoes, and BBQ chicken with carrots. 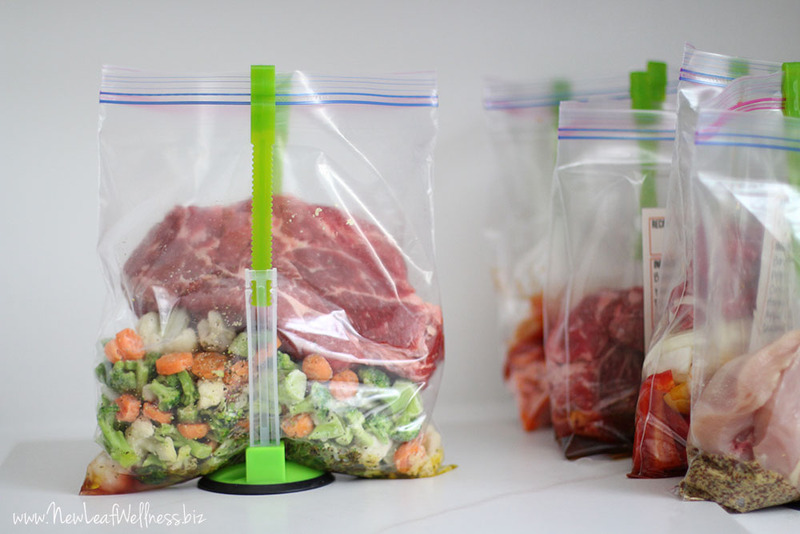 For a total of eight meals, you make a second bag of each recipe with beef instead of chicken. Check all of the condiments, like vinegar, hot sauce, ketchup, soy sauce, etc. for hidden sources of gluten. 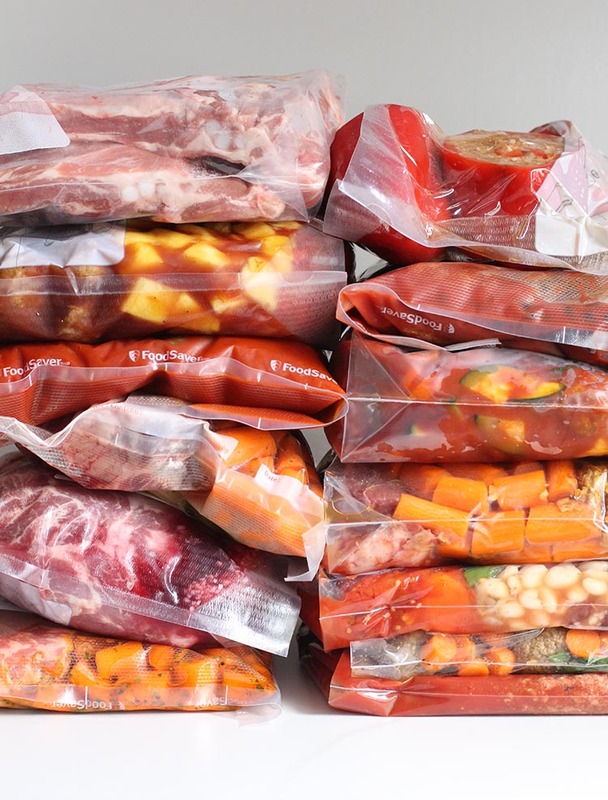 12 Crockpot Freezer Meals from Costco in 75 Minutes. This prep session includes recipes for red pepper chicken, honey sesame chicken, tomato turkey and veggie soup, and turkey and black bean chili. To take advantage of Costco’s great deal on bulk foods, you triple each recipe and make three bags of each. (Trust me, you’ll want three of each because they’re so delicious!). Check the Italian seasonings, soy sauce, ketchup, and chicken bouillon/broth for hidden sources of gluten. 6 Crockpot Freezer Meals from ALDI in 40 Minutes. This prep session includes recipes for cranberry chicken, Italian chicken, and tomato beef veggie soup. To save time and money, you double each recipe and make two bags of each. Check the vinegar and pasta sauce for hidden sources of gluten. 8 Crockpot Freezer Meals from Whole Foods in 35 Minutes. This prep session includes recipes for chicken teriyaki (x2), chicken chili (x2), honey dijon pork and green beans, hot pepper pork and butternut squash, beef fajitas, and pepperoncini shredded beef. Check the teriyaki sauce for gluten. 6 Healthy Crockpot Freezer Meals in 50 Minutes. This prep session includes recipes for balsamic beef roast with carrots, lime shredded pork, chicken teriyaki. To save time and money, you double each recipe and make two bags of each. Check the soy sauce, vinegars, and broth for gluten. 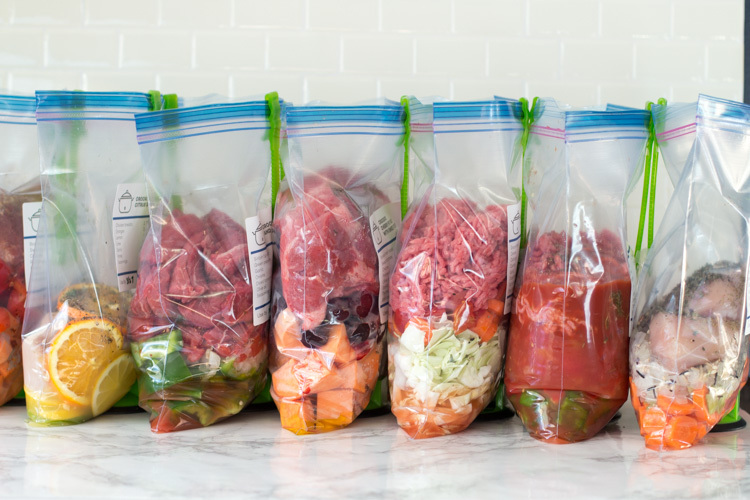 3 Ground Beef Crockpot Freezer Meals in 30 Minutes. This prep session includes recipes for stuffed peppers, hamburger vegetable soup, and sloppy joe’s. Use homemade vegetable beef seasoning mix and gluten-free pasta sauce and Worcestershire sauce. Serve the sloppy joe’s over baked potatoes or sweet potatoes. 31 Gluten-Free Dairy-Free Crockpot Freezer Meals. 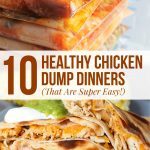 This includes too many recipes to list here, but my favorites are chicken curry, turkey black bean chili, banana pepper shredded beef, and honey bourbon chicken. Yum! 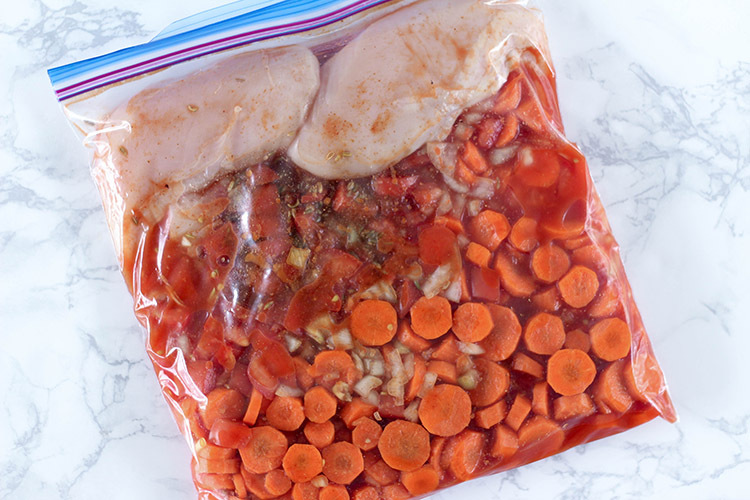 7 Healthy Chicken Crockpot Freezer Meals in Under an Hour. 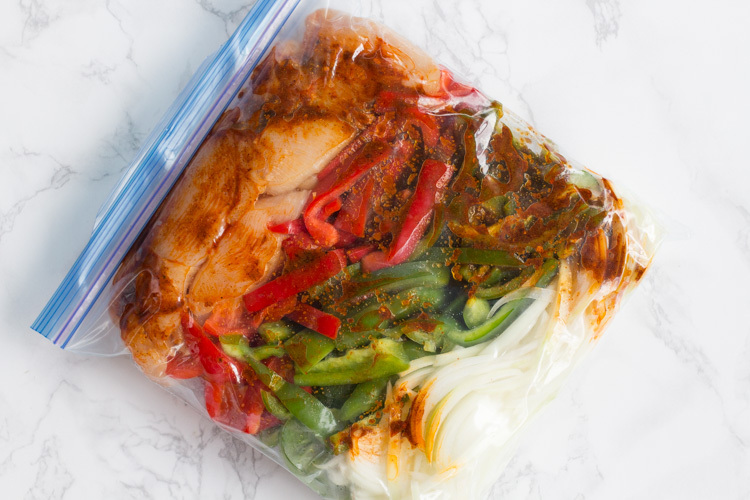 This prep session includes recipes for red pepper chicken, lemon pepper chicken, chicken Philly cheesesteaks, spring chicken soup, chicken fajitas, Hawaiian chicken, and southwestern chicken chili. Omit the orzo, use gluten-free soy sauce, and serve the chicken Philly cheesesteaks over rice (no bun or cheese). 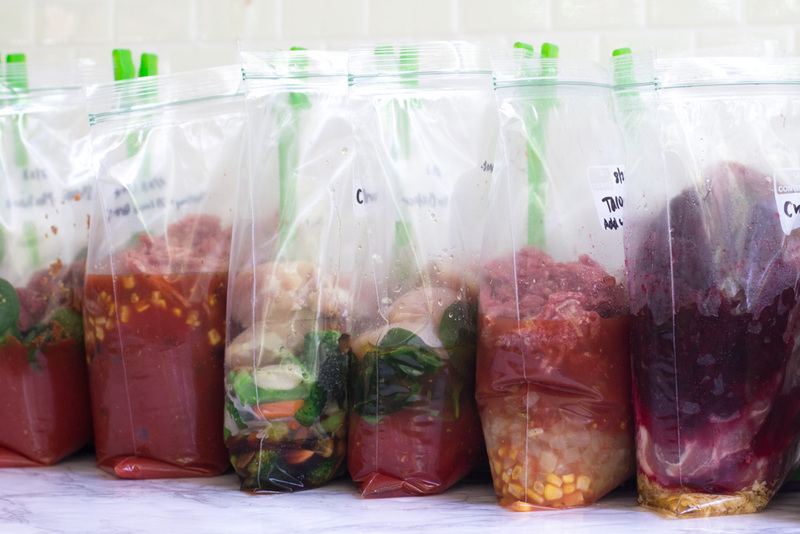 8 Healthy Crockpot Freezer Meals in 75 Minutes. 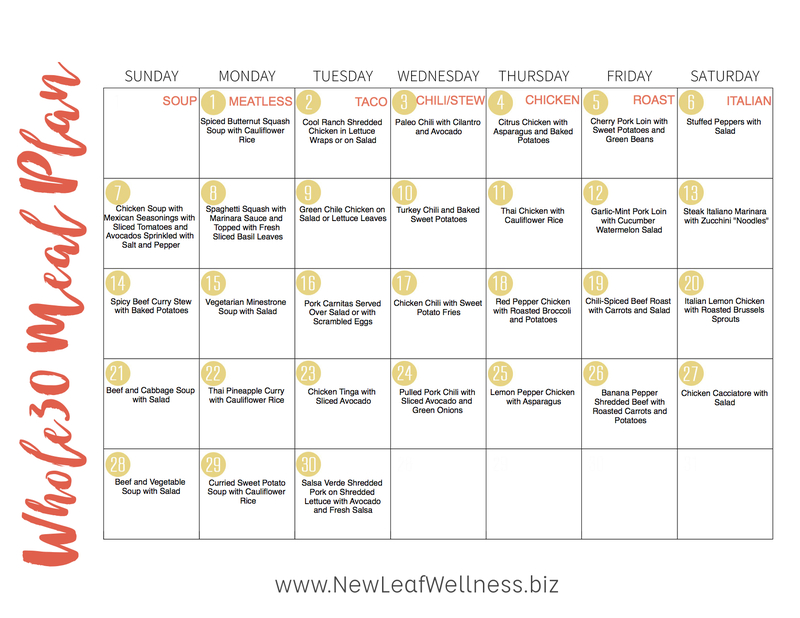 This prep session includes recipes for beef roast with carrots, chicken fajitas, Mexican chicken soup, and garden veggie soup with ground beef. 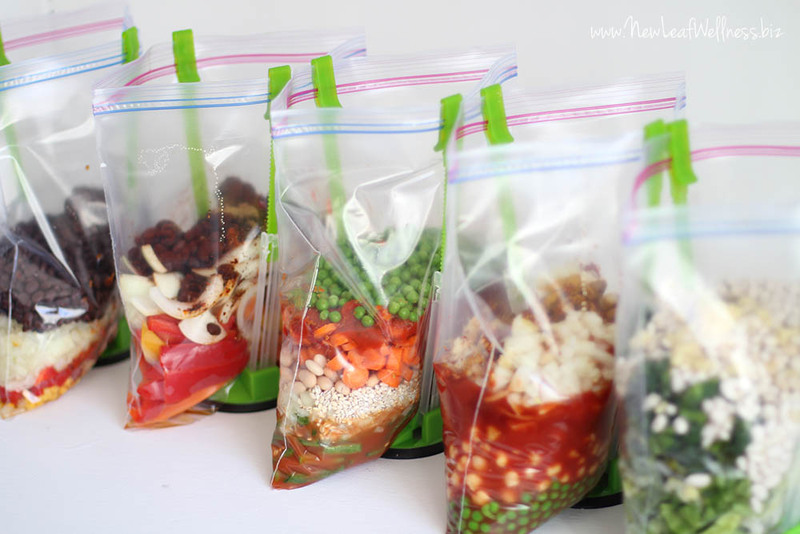 To save time and money, you double each recipe to make two bags of each. Check the vinegar and pasta sauce for gluten. 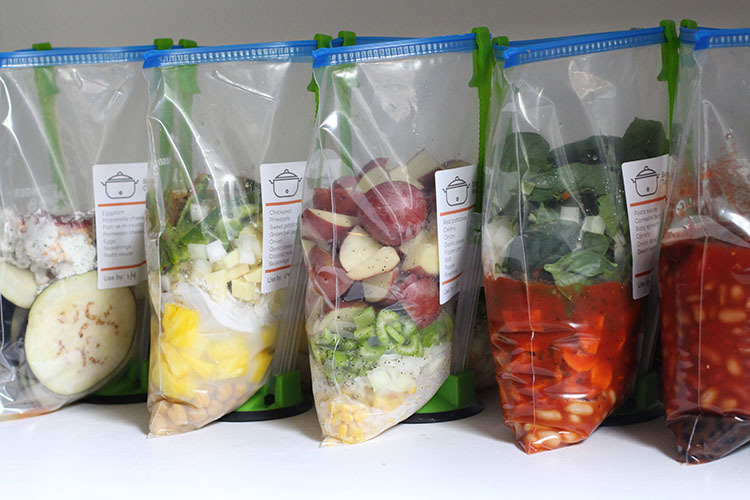 5 Vegetarian Crockpot Freezer Meals in 50 Minutes. This prep session includes recipes for greens and beans, coconut chickpea curry, black bean fajitas, Mexican black bean chili, and hearty tomato veggie and barley soup. I basically took our favorite crockpot recipes and found substitutes for the meat. 31 Vegetarian Crockpot Freezer Recipes. This post includes my favorite vegetarian crockpot freezer recipes that I’ve tried over the years. Some of the best are coconut chickpea curry, eggplant roll-ups, broccoli cheddar soup, mushroom spinach stroganoff, and Thai pineapple curry. I think this is the only post that doesn’t contain a full shopping list. 7 Meat-Free Crockpot Freezer Meals in 90 Minutes. This prep session includes recipes for black bean enchilada stack, cheesy eggplant bake, Mexican stuffed peppers, potato corn chowder, Thai pineapple curry, three bean chili, and Tuscan tortellini soup. These were the meals from my meat-free freezer cookbook eBook. 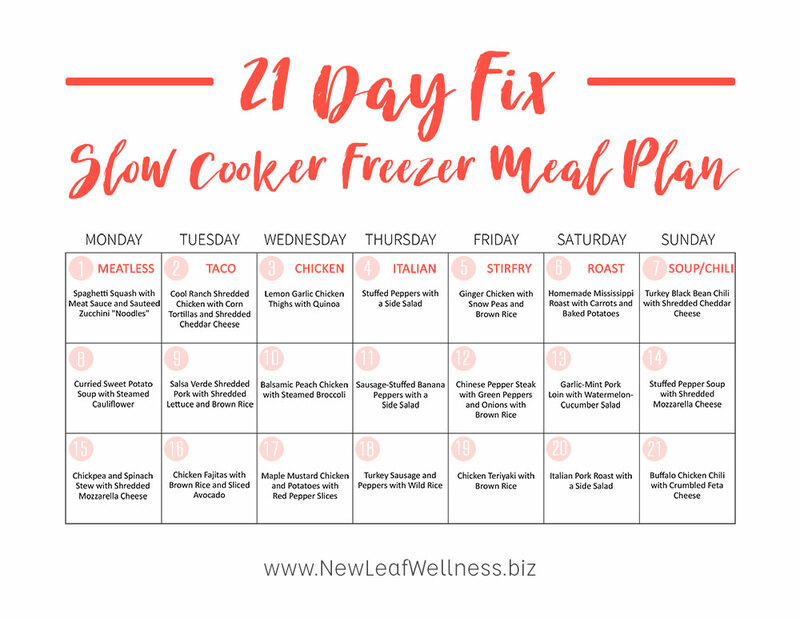 The Ultimate 21 Day Fix Slow Cooker Freezer Meal Plan. This prep session includes 21 crockpot freezer recipes that (container counts included), a printable shopping list, a filled out meal planning calendar, printable freezer meal labels, and more. My favorite recipes are homemade Mississippi roast, turkey black bean chili, Chinese pepper steak with green peppers and onions, and chicken teriyaki. I am about to return to work for the first time in 4 years after having 3 kiddos….you are literally saving my life with your site! 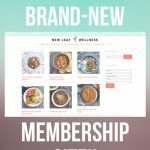 We are also a whole30 family so thank you for that! Question: is there any rhyme or reason to what order everything goes in the bags? I usually put veggies at the bottom, spices and seasonings in the middle (so they don’t get left in the bag), and meat on top (so it’s the first ingredient dumped into the crockpot). Good luck, Aynsley! Thank you thank you thank you!!! What an incredible resource you’ve provided here. As a homeschooling mama, I’m always short on time & energy by the time dinner rolls around. These meals are a life saver! Can’t wait to try them out! Love these! I’ve got to do a low fat, low cholesterol diet. Most meat recipes I’ve looked at are so high in cholesterol. I like meat though! Help! 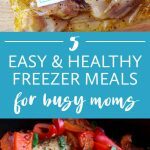 Which freezer meal plan would be best? Hello! Thank you for all of these! I did the low carb meals in the crockpot…is there anything that lists the nutritional information for the meals?